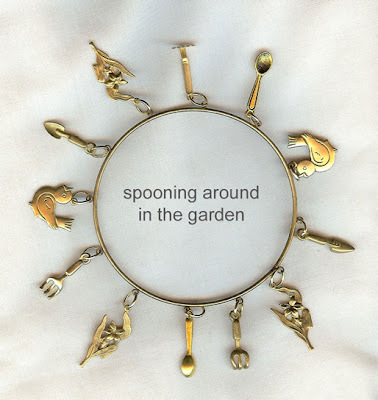 Spooning around in the garden is a hard bangle style bracelet, featuring garden themed charms. 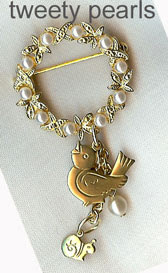 Tweety pearls is a customised vintage brooch. 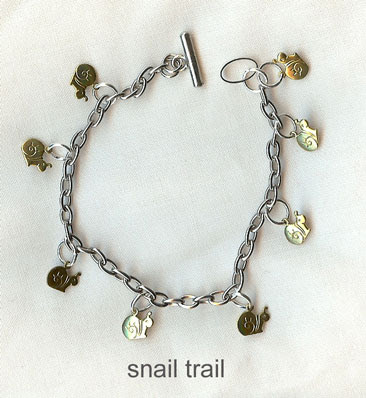 Email a title, as a starter for a commissioned piece, and see what you get! 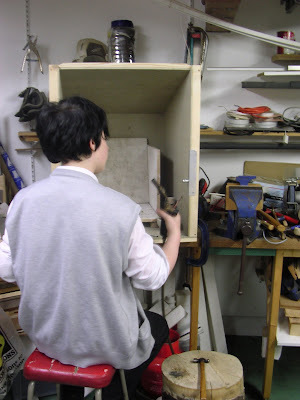 In the pic above you can see a fireproof box that Laurence has made for him, a safe place for flames! 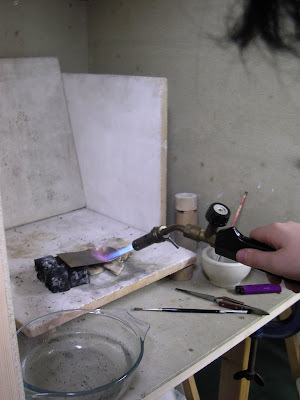 Here, inside the fireproof box, you can see Toby annealing the metal with his torch. 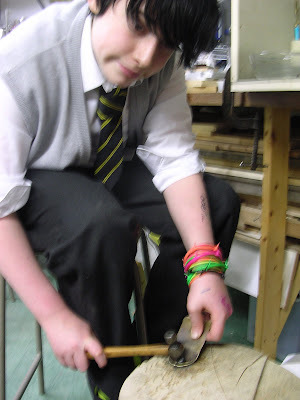 Toby carved out a hole in this large piece of tree trunk, he is hammering the metal into the dip (forging) to make a spoon. Here you can see Toby filing down the edges of the spoon. 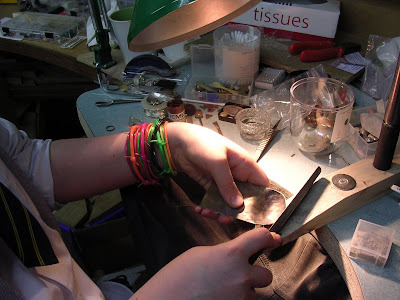 In this photograph, you can see the jewellers workbench that Laurence has made for Toby. 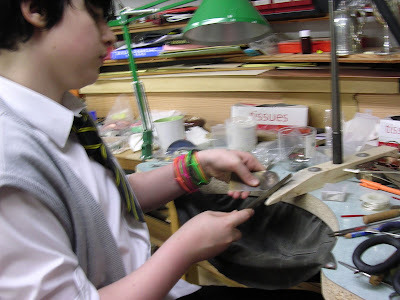 He cut a semi-circle out of a spare piece of kitchen top, then cut up an old leather jacket and stapled it under the semi circular cut out, to catch any bits and pieces that might fall. He has also made a jewellers 'peg' which you can see jutting out the middle, this is used to rest things on whilst working. There's also a 'ring sizer' standing on the top. 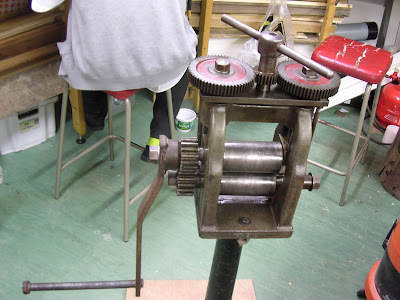 Toby bought this lovely old rolling mill, second hand, for £50, using the profits from his jewellery sales! 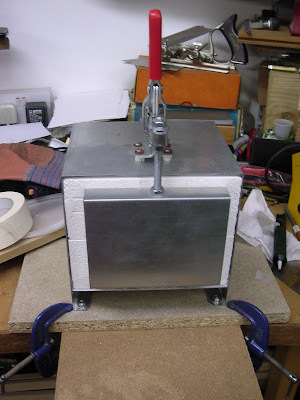 He buys silver jewellery and cutlery, anything he can find, in charity shops, car boot sales, ebay, etc, and melts down the reclaimed silver, then rolls it into sheet himself using this mill, ready to make his own creations! Another investment from the jewellery sales, this little kiln, though Toby hasnt had much time to use it yet. 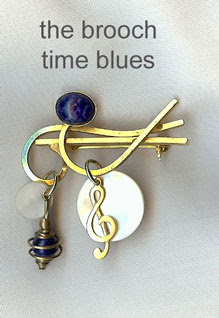 He has made one pair of earrings, enamel on copper, with diamonte, a commission at Christmas time. 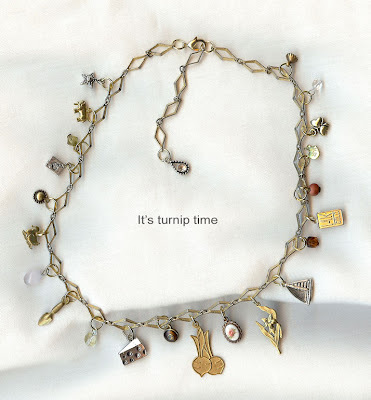 Turniptime is a necklace designed in similar style to a charm bracelet using an unusual vintage diamond shaped chain as a base. 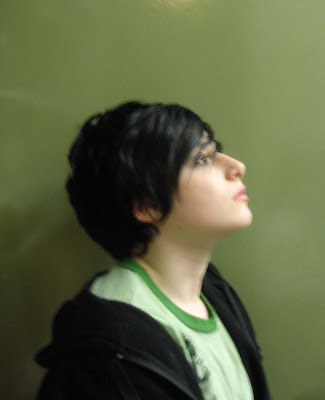 If you click on the image it'll appear larger so you can see the necklace in more detail. 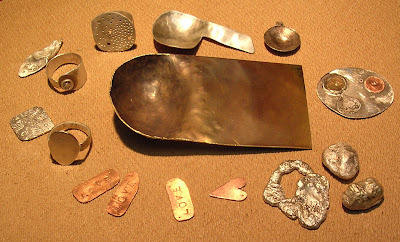 Here are a couple more pieces to show you, both for sale at The Aardvark Gallery in East Sussex. 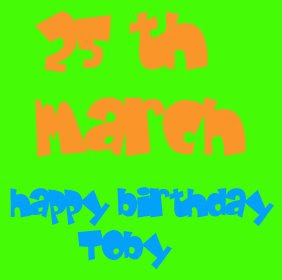 Click on the pic above to enlarge image and to read more easily. 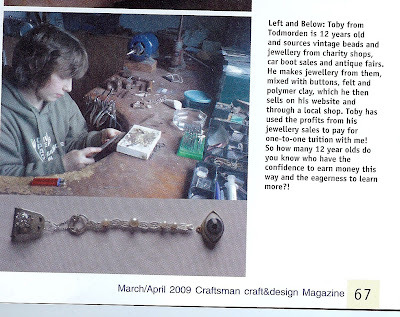 This is part of an article about jeweller Yvonne Chadderton http://www.yc-jewellery.co.uk/ , featuring Toby, in this months Craft&Design magazine. The photo and age are a little out of date now though!